Fill this out now to have enchanting content ideas in minutes! 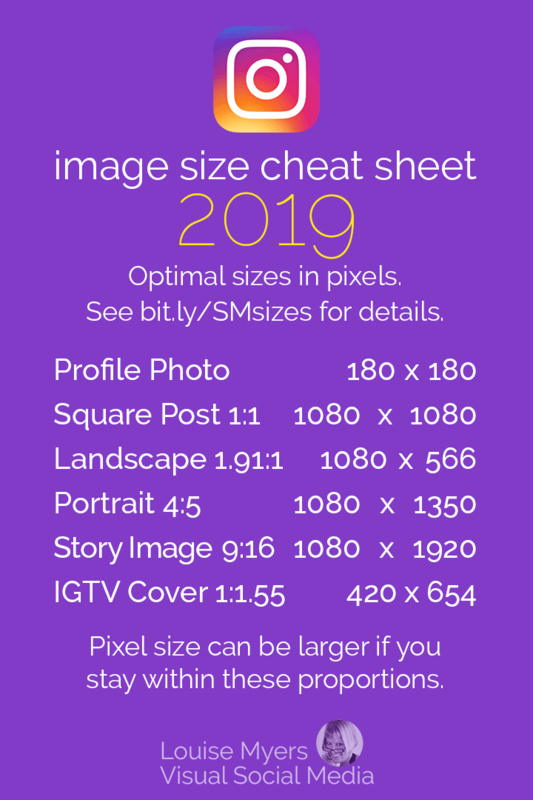 You are here: Home / Social Media Tips / Social Media Cheat Sheet 2019: Must-Have Image Sizes! I’ve included ALL essential sizes for Facebook, Pinterest, Instagram, Twitter, LinkedIn, AND YouTube on the chart. You’ll find notes about aspect ratio and maximum file size where known. Google+ and Tumblr sizes are listed at the end of this post, though not on the chart. The platforms are now listed in order of my audience’s interest, and I’ve added a Table of Contents if you need a quick answer. You’ll find it underneath the important cross-platform considerations below. Please leave a comment if any need to be corrected. I’ll update as quickly as possible! Here’s a brief rundown of some critical social media photo sizes. 1200 pixels square is ideal for Facebook and Instagram posts. It also works well for Google+ and LinkedIn posts – and for Twitter, if you keep any type or other critical elements away from the top and bottom of the image. A square is a 1:1 aspect ratio. Squares can also be posted on Pinterest. Test these against the recommended 2:3 Pins, and see how squares go over with your audience. If Pinterest is your main platform, try the 2:3 images on Facebook, as they work there too. Want to cover both Instagram and Pinterest? Try 4:5 aspect ratio. It’s my favorite size for IG, as it takes up all available height in the feed. Note that it’ll still be cropped to a square on your profile gallery. Facebook, Twitter and Linked in are all recommending 1200 x 628 pixels, which is 1.91:1 aspect ratio. You need to be including this shape image on every blog post and page! Multiply the width of your content area by .524 to get the image height. Since my content area is 720px wide, this comes out to 720 x 377 pixels for me. How do I get images to these sizes? Q: Do you have recommendation for how to get photos these desired image sizes? I am using iPhoto and I am not getting exact dimensions you describe. A: You could use a free online photo editor like pixlr.com. Alternatively, you can use an online image creator that has lots of sizes already set up for you! The two easiest ones I’ve found are Stencil and Snappa. Choose a size template, pick or upload a photo, and it’s automatically sized to fit. Adjust cropping as desired. Both have a free option or free trial. The paid plans have an amazing Instant Resize feature, so you can make perfectly-sizes images for every network! Watch it on Stencil below. Disclosure: If you upgrade for additional features, I may get a small commission. I only recommend what I’ve tried, and think you’ll love! Loads of great info on this page! In a hurry? Click to jump to the section that interests you most. In August 2018, Facebook applied Page Templates based on your business type, such as Services, Restaurant, or Store. This hasn’t affected the image sizes though. Cover photos are still the same. Recommended proportion for all Facebook cover photos: 16:9. This works perfectly on mobile. You must allow cropping top and bottom on desktop, so don’t place text or other critical elements near the top and bottom. This proportion works out to: 1200 x 675, 1640 x 923, or 1920 x 1080. Your choice! I always recommend going with a larger image for best quality. While FB sometimes specifies minimum sizes required for upload, modern displays have such great resolution that low quality images don’t cut it any more. Go BIG! New in June 2017: You can use a video as your cover photo. Instead of a cover photo, now you can use a video. It can be 20-90 seconds and should be at least 820 x 312 pixels. Re minimum wall post size, I hope you are using larger photos than minimum already! Up to 2048 x 2048 works for Facebook photo posts. For more details on Facebook image sizes, see the linked posts. Facebook Page Cover photo size: 820 x 312 desktop / 640 x 360 mobile | Optimize for both! Facebook Photo post size: on the wall, 476 x varied height, larger gives better quality. 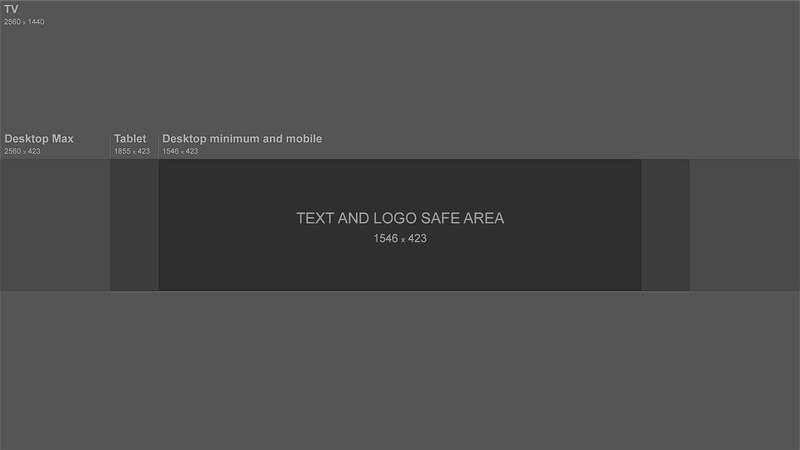 Facebook Group Cover photo size: 1640 x 859 minimum, this post helps you optimize for mobile and desktop. 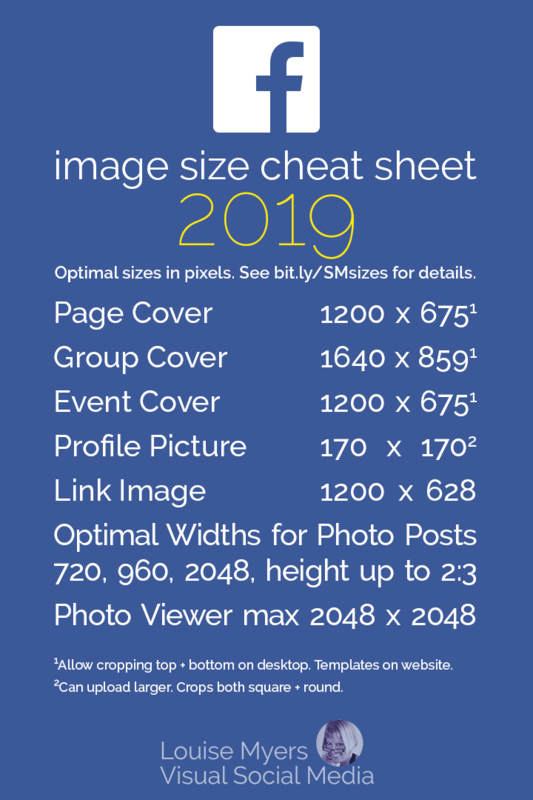 Pin the Facebook image sizes cheat sheet, and read on. Pinterest has verified that Pins taller than 2.1 times their width will be cropped in the feed. They recommend 600 x 1260 as the tallest proportion for Pins. However, taller Pins will be seen in full when clicked (March 2018). I still recommend tall infographics! They perform for me. Read all the details on Pinterest sizes. Note that Pins no longer appear at 736 pixels wide when clicked (changed Fall 2017). Now they’re never seen bigger than 564 pixels wide. I had a reader who made Pin images to 564 width and reported that gave her the best quality result after uploading. However, I’ve also been told that Pinterest says not to go smaller than 600px width. Pinterest is recommending 2:3 proportion as optimal (example: 600 x 900 pixels), and also saying squares are fine. I don’t see squares performing as well as taller Pins, though. If you already have square images for Instagram, test with your audience on Pinterest. Pinterest board covers are SQUARE. I recommend 600 x 600. If you use the Showcase feature, you’ll want to make sure you make them at least 340 x 340. Note: Few Pinners look at profiles and boards, so covers aren’t a necessity. 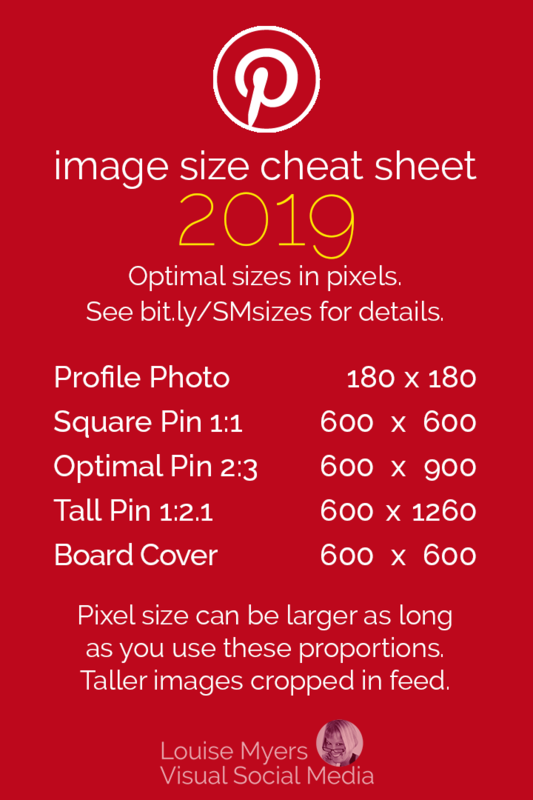 Pin the Pinterest image sizes cheat sheet, and read on. Instagram posts are no longer limited to square! However, your images will still be cropped to square on your profile page gallery. For details, read: Instagram Photo Format Breaks Out of the Box! Instagram landscape photo size: 1.91:1 proportion, or 1080 x 566. Instagram portrait photo size: 4:5 proportion, or 1080 x 1350. 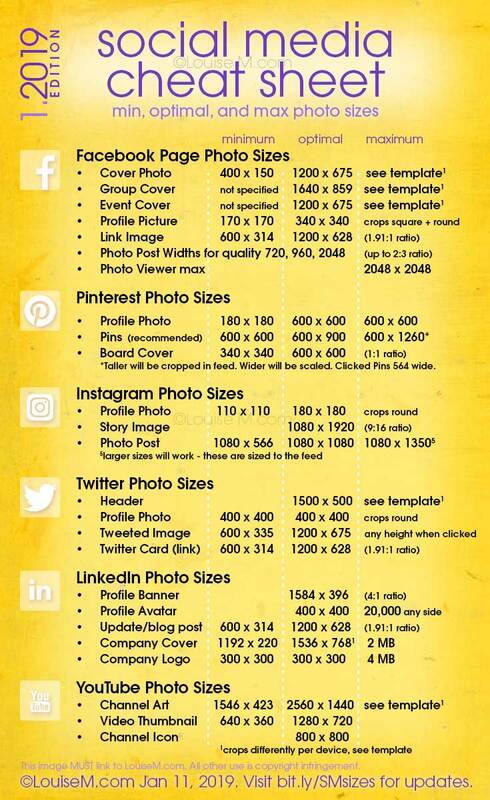 Pin the Instagram image sizes cheat sheet, and read on. Tweeted image size changed in 2017 and is still quoted incorrectly almost everywhere. Let’s go by what Twitter says, shall we? Tweeted images are not 2:1 proportion! If you post that size, the edges will be cut off in the stream. Tweet images will still be shown in full when clicked, so you can use square for portability across social media networks – but they’ll be cropped in the feed on mobile. For two images, the images will be side by side, both at 7:8 aspect ratios. For three images, there will be one 7:8 aspect ratio image on the left, with two 4:7 aspect ratio images running up the right side of the image. For four images, there will be four 2:1 aspect ratio images in a grid. 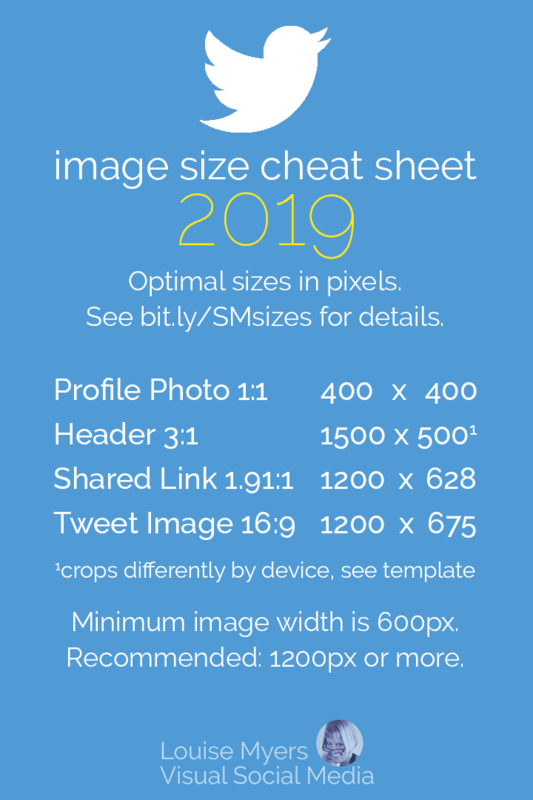 Pin the Twitter image sizes cheat sheet, and read on. Those maddening responsive background images (banner / cover photo) on personal profiles were dumped in August 2017. The new recommended size is 1584 wide by 396 high. This is exactly 4:1 proportion. 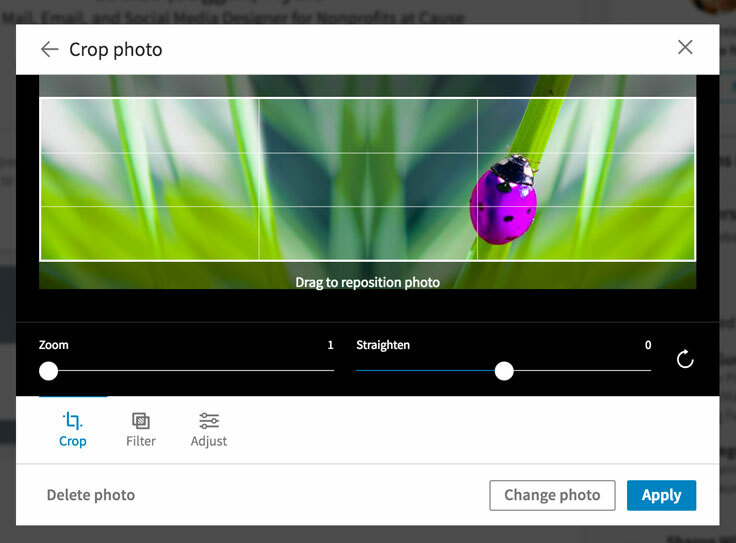 You can also crop, filter, and adjust your photo after you upload it to LinkedIn. If your background image appears blurry or pixelated, please choose an image with a file size as close to the maximum (8 MB) as possible, as images with larger file sizes typically look better. Photos will also look better than images with logos. LinkedIn image recap: Max file size 8MB and file type must be PNG, JPEG, or GIF. LinkedIn profile cover photo: 1584 wide by 396 high. This is exactly 4:1 proportion. Linked in profile picture: Per LI, upload any size between 400 x 400 pixels and 20,000 x 20,000 px. LinkedIn blog post link shares match Facebook’s! 1200 x 628 px. LinkedIn photo share: 1200 x 1200 square looks best on desktop, but gets cropped to horizontal in the mobile feed. The link share size works best there¹. LinkedIn Company cover photo size: 1536 x 768 px². LinkedIn logo size: 300 x 300 square. No more horizontal. More company and career page image sizes on LinkedIn here. ¹LinkedIn photo post size seems difficult to determine. It appears to be a slightly taller shape than previously, but no one seems to agree on the size (see this discussion). If you find someone who makes picture quotes specifically to a LinkedIn size, won’t you let us know? One woman suggested 792 x 528px. I checked and it did look the same on desktop and mobile. However, when you click on desktop, it gets so much bigger. I’d double those dimensions for best clarity. ²There’s some question as to how they work. The height is greatly cropped. I suspect that the cover image proportions work for mobile. Just as with Facebook and Twitter, the height gets cropped on desktop – although much more severely. Unfortunately, you’ll have to create something and test it on different devices if it has critical elements that need to show. Or else think of it as more of a “background” image that doesn’t have faces, type, or other elements that would look bad when cropped on different devices. Your cover image may have to be adjusted to fit the screen which may involve trimming the image horizontally or vertically. We recommend uploading a high-quality image with as little text as possible to ensure an optimal display on all devices and screen sizes. Our accepted image formats for uploads are PNG or JPEG. 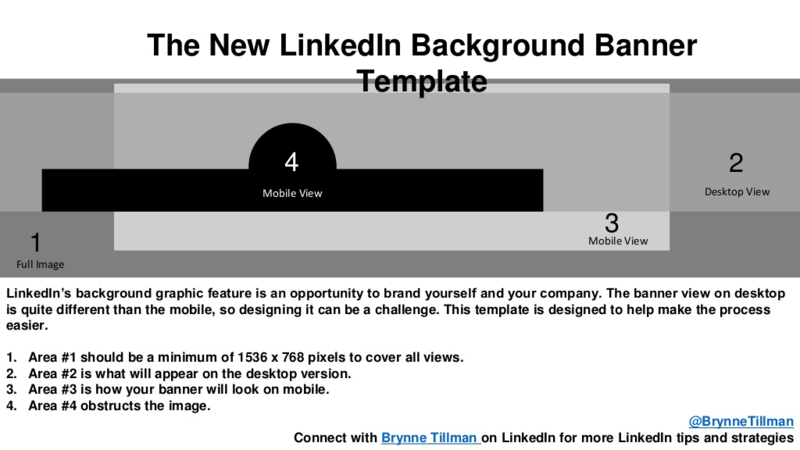 Here’s a LinkedIn company cover photo template from Breanna Tillman that a reader shared: Download the LI company cover. The proportions don’t seem correct, but I’ll let you mess with that if you want. With these responsive headers, I recommend uploading an appropriate photo background and letting the cropping fall where it may. With different crops on different devices, LinkedIn company page headers have become too difficult to place text on. 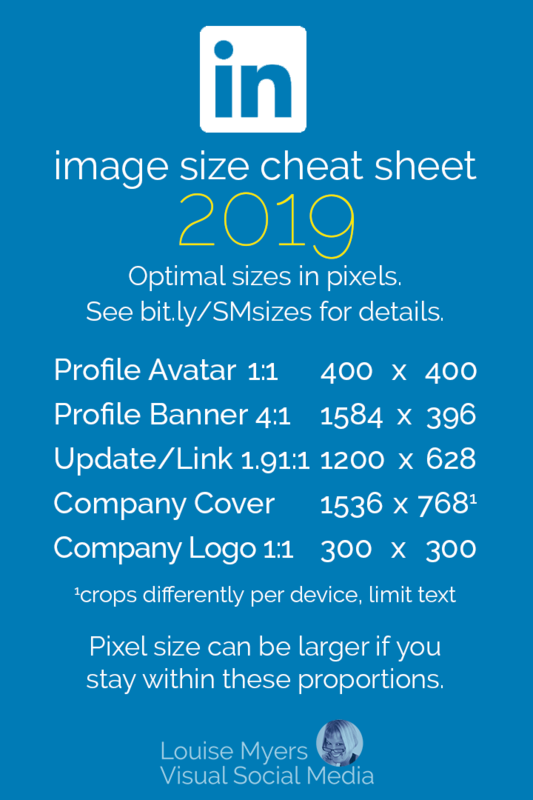 Pin the LinkedIn image sizes cheat sheet, and read on. Now that you’ve got the sizes – what images should you post? It’s hard to find image sizes for this platform, and one reason may be that it’s pretty freeform. Different themes can vary greatly. I don’t use Tumblr and decided not to add it to the cheat sheet, since I won’t know if things change. Although all themes are different, the most common sizes still display 500 and 400 width posts (and most “photography” themes either display everything with a width of 1280, or even the highest resolution available). Tumblr has implemented a “dashboard pop-over” with a header, which works both as a mobile theme and allows desktop users to have a quick glance at a blog without leaving the dashboard. The header displays at “various sizes” with an aspect ratio of 16:9. Generally, it displays at 1240 x 700 for desktop browsers, but is optimized at 640 × 360 for mobile. I hope you find my cheat sheets helpful! Let me know if your experience differs. Help battle the misinformation being passed around. Size does matter! Pin and share this complete updated social media cheat sheet with your friends and followers. Thank you sooo much for this article. I have been looking everywhere for the dimensions for the Facebook group cover (since they changed it again) and the help section in FB itself gives the wrong dimensions. Your measurements of 16:9 worked great on both my desktop and my phone. For LinkedIn posts in the feed, images should have minimum dimensions of 552×368 pixels. Any larger image is fine so long as you maintain the 3:2 aspect ratio. That’s interesting. I’m seeing all different shapes from wide to tall in the feed. I’ve never heard a limit specified. You’d have to test and view on various devices. Is there a standard size for sharing Images on a LinkedIn company page that won’t cut off the image if seeing from my cell phone? When updating a client’s company page and sharing posts, I follow the recommended dimensions and it looks good on my desktop. If I check the same post on my phone, the image gets cut off. Is it a problem with iPhones? Or just all mobiles? Don’t know. When I checked the feed on my iPhone a couple weeks ago, I saw all shapes of images from both profiles and pages. None appeared to be cut off. Nice infographic. I’ve shared on FB. Helpful for me as I regularly share my blogs on social media. With Instagram I face the problem, so now I have a clear idea of it. This is very useful. Thanks for the information. I just wish that there was just one standard for all social media. It’s a nightmare trying to keep up to date with it all. Especially as they keep moving the goalposts! Thanks so much for this. They’re ALWAYS changing sizes! Drives me crazy. Very helpful. Thanks for all the work you did to produce this —and for sharing. Loved this! Do you have more sizes for the different creative properties of Facebook Ads? What is the standard header size for Blogger? A quick search tells me it varies by theme. Excellent information Louise! – just what i’m looking for – social media image sizes!! Thanks for sharing this article.THis article help us to know about the image sizes of different social media. Thank you, thank you & thank you! I have experience driving traffic to website’s, online bookkeeping. I was & I am an Experienced Executive Asst, former operations manager for an online business. I took another route, and hopefully on my way with my own business online real soon so I’m very excited. I am my own independent house cleaner . & my client right now is my landlord cleaning empty houses & apartments, and he has many all around the city I livein ! He must own like 1/2 the houses in my area. I’ve also been lucky to get another 2 clients to clean houses for. So I will be multi tasking online & working as a house cleaner vacant or not! Thank you so much. I’ve learned alot in my 3 yrs working online as an executive asst /operations manager /online Quickbooks task Mr using “Asana”, and an investor with empireave. com which is a great way to meet ppl all over the world. Business owners or employers /employees, Entrepreneurs as well! You ROCK Louise this is your icing on my cake lol ?? Hi, after couple of different sizes, finally we’ve found one today 1200x630px, big enough and good for both desktop and mobile from browser ( and also in app). Just wanted to thank you for keeping these up to date! You’re a time saver!! Thank you for sharing LinkedIn specs… It was really hard to try to figure it out by myself. The template is a life-saver! Thank you so much for making your cheat sheet available to the social media-challenged such as me! I own a business and I really struggle with consistency in my social media marketing. Thanks again for equipping me with helpful info! Thanks Louise, helpful post. Do you know the recommended photo size and dimensions for Flicker cover photo? I’ve tried several times and always show me the result not fit the actual size. Thanks in advance. I don’t use it and don’t know. Louise, I love, love, LOVE this page! Thank you for keeping it updated. I really rely on your expertise, particularly for posting photos to the various social media profiles. You rock! You explanations of this stuff are the best on the web. Simple, clear, tested by a real person! Thanks so much Louise! 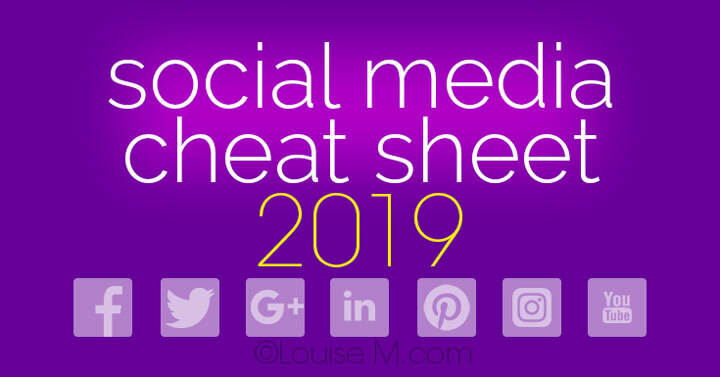 Thanks to Amy Collins for connecting me to you and your wonderfully well organized, “do-able ” and highly specific Social Media cheat Sheet. Perfect timing for my life! Any ideas on the new size please? I’m not seeing this on either iPhone or Chrome browser. What device are you using? Great advice! I’m always second guessing myself about photo size on my blog and how to figure out the best size so I don’t significantly slow down my self-hosted server. I’m pining this for future reference! Great list! I’ve bookmarked it for future use. It’ll definitely come in handy. Just a small note as I was going through: The LinkedIn image courtesy of should be Brynne Tillman, not Breanna Tillman. I prefer Canva for most of my designs. Give that a try. You’ll love it. I know many people like Canva but I’m not one of them! •Use a 1.91:1 ratio (1200×627 px). •Image must be more than 200px width. •If your image width is less than 200px, it will not display in the larger image format. Instead, images will appear as a thumbnail on the left side of the post. •Images on mobile will not be cropped. Images of other ratios will show in full with subtle white padding. That’s for a company page and not a regular profile. As far as I can tell, there’s a lot more flexibility in image size for a profile update. Regarding LinkedIn, I have noticed that making it 1400×750 will crop the bottom and top of your image. The most appropriate size would be 1400×725 (maybe 720); this is the only size that worked properly up to this moment. Good to know. Is this for a link share, photo post, cover, or ??? It sounds very close to the recommended 1.91:1 link share image. I still see various sizes/shapes working for photo posts. Valerie, I’m not seeing or finding anything about a change. What are you seeing on desktop and mobile? What a great help! Thanks for taking the time to post this! Hi, just wanna say thanks very much for this! I’m a social media manager so this is so helpful! Louis, that’s for making all the info in one place BTW the resizing tool you mentioned was cool and should do the job on its best. I’ve been writing my blog posts for awhile now, making my headline banner images 1200 x 637. That was auto-delivered to FB via dlvr.it and rendered as an oblong to present my news item to my readers. That is still happening on one FB account. BUT, this week I noticed on another FB account that the banner headline images are being rendered SQUARE! Consequently my downloaded image is truncated, and part of my headlines contained in the image look awful! Got to love Facebook, eh? Have you tried direct posting instead of using that service? Me again. Just done a further test in a Group. Interacting as a Page in a Group, I’m seeing images rendered from websites as a square. Interacting as myself in a Group, I’m seeing images rendered from websites as an oblong. Thank you, Louise, great to have all the sizes noted in one location. Hi thanks for this great article, its a great help. For you next update, I’d recommend to add the sources for the sizes and ratios. Any particular reason? Are you looking for further info on some of these? There would be so many sources to cite, so I’m wondering if there’s something in particular you need. Also, most sizes already have links to other articles where I’ve gone in-depth into why the sizes listed on this page are optimal. Thanks! Updated everywhere but the share settings 🙂 Will fix it now! I am trying to create a cover image for a facebook group, I have tried all 3 sizes you recommended and sizes recommended on other blogs and no matter what size I use my whole image does not fit! I am using pixlr editor to adjust the image size, what am I doing wrong. I am getting so frustrated!! The whole image won’t show on both desktop and mobile, as they’re cropped differently. If you haven’t yet, I suggest you get the details on my in-depth article. There’s also a template. Thank you so much for the Pin graphics. I appreciate the 2019 sizes for our blog posts about our year travel in Italy! “WOW” Thanks so much for doing the heavy lifting on this! So Appreciated!! I am a designer and have an issue with the cover image on Facebook in size 1200X675. It is looking fine on desktop browser and on Facebook app. But the same image when open in mobile browser is getting too blurry and pixelated. Do, you have any answer regarding to this issue. The same is for LinkedIn also. I don’t have an answer for that… but I do wonder how many people would be using a mobile browser instead of the app. That info is already in this post and/or the linked posts.